Prize: weekly winner will receive a $25.00 gift certificate towards a Sunday Buffet at Southside Pizzeria, located at 25 Lansdowne Street in Peterborough Ontario. 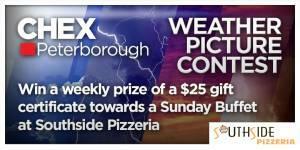 What you must do to enter: Take a digital photo of the weather in your area.2) Email it to us at weatherpicture@chextv.com. Be sure your photo is in hi resolution jpg format. Statistics: This contest was opened by 48 and entered by 0 ContestChest.com members. 0% of those who opened the contest, entered it.